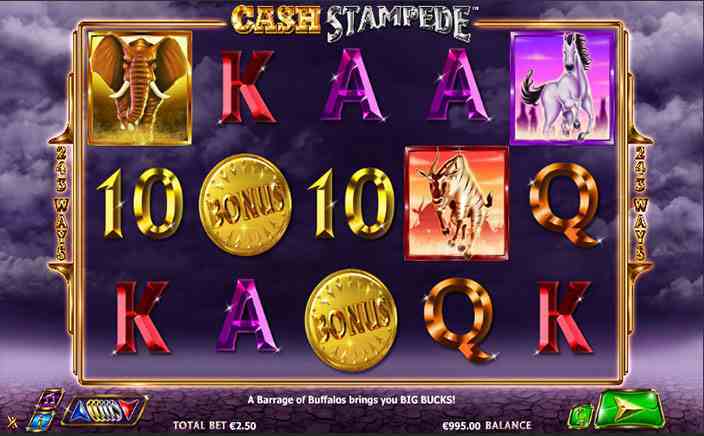 Cash Stampede is a slot game powered by master slot game developers NextGen. The game has 5 reels and 243 ways to win. Set right in the heart of the African Plains this game is all about it’s bonus features. The bonus features include the Re spins feature and a free games feature. Both the bonus rounds are filled with goodies that will help you end this trip to Africa with you being a whole lot richer than when you started. Set in the heart of the African Plains. The home to the mighty African elephant, antelopes buffalos and a whole lot of other exciting animals the theme of this game is bound to entertain as long as you keep playing this game. The graphics of Cash Stampede too deserve a mention for their detailing. The game looks really good and thanks to some wonderful music, it sounds great too. 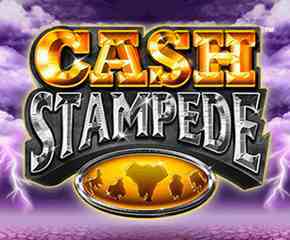 Cash Stampede has 5 reels and a cool 243 ways to win. The game is playable from 25p a spin to 50£ per spin. The diverse betting range will help attract a lot of people to play this game. The slot is a medium variance one with some small but frequent wins in the base game. But the real action takes place in the bonus rounds and that’s where all the big wins can be found. The best part of the game is the Re-Spins feature. Any win involving any animal in the reels along with a wild symbol will help trigger this feature. And also this feature can be re triggered. Don’t you just love it when a feature can be re-triggered? Then of course there is the free games feature which adds another dimension to this game making it much more interesting to play. Performance wise there are no issues with Cash Stampede. It works really smoothly on the mobile platform enabling you to enjoy this game without any worries of lags or any other performance issues. Cash Stampede is simply a stunning game to play. The graphics are absolutely top notch. The developers have obviously went for a dark and eery feeling game and they have managed to provide us with one. The reels look stunning with the dark sky as the backdrop. And the music just adds to feel of it. And the gameplay itself is as or if not more exciting than the theme. The bonus rounds will keep you on the edge of your seats and will provide you with thrills throughout the game. This simply is one hell of a game to play. Do not miss it or you’ll surely regret that you did.